Designing a car is so easy! First you need to make a design, then modify it to make it appealing like your boss wants. Then redesign some elements to make it flexible to meet the crash norms. Then decide the materials that need to be used on it. Then there will be issues for performance, fuel-efficiency, ride quality, handling. If that is not enough, different governments will only hound you to lower the fuel emissions. Thats very simple. Now, its time to get a bit serious. One such vehicle is the new-generation Audi Q7. After tasting success for the first generation, Audi got the second-gen Q7 that is a lot more sporty, stylish and contemporary. Now before the governments of the world could step in and ask about the CO2 emissions, for India now it seems engine size only matters not what it emits. 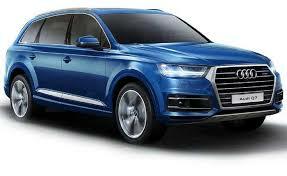 Take a look at the new Q7 and you will instantly realize that it has shaded lots of weight and looks sharper and slimmer compared to the previous model and it is definitely is a leap ahead. The Q7 is not the prettiest SUV around in the market but the sharp lines and creases surely makes it an attention grabber. The new Q7 not only has loosen some of its overall weight but also is 37 mm shorter and 15 mm narrower but that does not mean that it has less space inside infact the Q7 is actually more spacious now because there is 21 mm of additional room in between the first and the second row seats, while the headroom has also increased by 41 mm. Towards the front the single frame grille is deeply sculpted and also features thicker crossbar, while the headlamp unit too looks sharper and either features xenon, LED or Matrix LED technology. While the daytime running lamps in particular integrated inside the headlamps units are shaped like arrow. The air intakes towards the lower bumper are also bigger in size and helps adding the aggressive as well as the sporty feel to the SUV. Towards the side as we already mentioned above that it has became shorter in length than its predecessor while you will also notice that it has not really lost the muscular appeal. The exterior mirrors are still placed on the front doors shoulder. While towards the rear the steeply angled D pillar which has been a signature styling of almost all the Q models can also be seen even in this new SUV, the top end Q7 features dynamic turn signals while the rest gets standard LED lamps.Audi is also offering four completely new exterior colors along with 11 other exterior color options. Walk in to the cabin of the new Audi Q7 and you’ll be pleasantly surprised with the simple yet classy styling. The four-spoke steering wheel feels great to hold, it gets integrated buttons for cruise control and infotainment system along with the paddle shifts for changing gears. The updated all-digital instrument cluster has some fancy tricks up its sleeves. It shows an array of information related to the car and has a huge display for the navigation as well, nifty feature. The central part of the dashboard gets a seamless layout of AC vents across the panel. There is a layer of brushed aluminium below it and then a gloss wood panel followed by beige colour tones. The quality, fit and finish is just supreme as the buttons feel tactile to use and the materials feel premium when you touch anything. The best part about the styling is that it’s very minimal and uncluttered yet looks fancy. Push the button to start the engine and a 8.2-inch infotainment screen pops out of the dash neatly. If you find it intrusive while driving, you have the choice to fold it down with a touch of a button. The interiors are driver focussed and you have all the controls within reach. The updated MMI system also gets a touch pad along with the rotary knob, which is very convenient to use as you can scribble names/numbers while driving. The Bluetooth connectivity is quite extensive as you get to access your contacts as well as music library. The Bose audio system churns out excellent quality music that was expected from a car in this class. The ergonomics are top notch as you get an electrically adjustable steering wheel for both reach and rake as well as seats with memory function. There are quite a lot of storage bins to keep the cabin neat and tidy. The steering to the seat angle is quite confident inspiring and there is a good view of the road ahead for comfortable long drives. However, the driving position is a tad lower than what we thought considering it is an SUV. The leather seats get fantastic cushioning and support at the front. The rear seats are very spacious and offer ample legroom with good headroom and also enough shoulder room to accommodate third passenger in the middle who gets individual support cushioning unlike many other cars. The sad part about this seven seater is that it’s not a seven seater in India since it gets a spare wheel mounted in the boot that takes the space of the rear right seat of the third row. Boot space is good though and you have flexible seating options as all the seats are individually foldable. Under the bonnet, it has a a 3.0-litre diesel drivetrain, which comes with a displacement capacity of 2967cc. Integrated with a common rail fuel injection system, this mill delivers optimum performance. This four cylinder mill has the ability to generate a peak power of 245.4bhp in the range of 2910 to 4500rpm and yields a torque output of 600Nm between 1500 and 3000rpm. Mated with an advanced eight speed tiptronic automatic transmission gear box, this SUV delivers superior performance on road. It achieves an incredible top speed of 234 Kmph and also returns a modest fuel economy. The current generation Q7 houses a 3.0-litre diesel mill that is incorporated with a common rail fuel injection system. There is nearly 22 percent improvement in its fuel efficiency, considering its lowered weight and improved power output. The maximum mileage comes to about 14.75 Kmpl as per the ARAI certification, under standard driving conditions.This 3.0-litre oil-burner has the capacity of churning out a maximum power of 245.4bhp between 2910 and 4500rpm. Meanwhile, the torque output is 600Nm in the range of 1500 and 3000rpm. Both the variants have its front and rear wheels fitted with robust ventilated disc brakes. It is further assisted by anti lock braking system along with electronic brake force distribution. Besides these, it has anti slip regulation, which prevents spinning of wheels and improves traction control. It is also gifted with an electronic stabilization program (ESP), which helps to keep it stable and under the control of driver. On the other hand, it has adaptive air suspension system with variable adaptive damping system on all the four wheels. It helps in keeping the vehicle well balanced and give a comfortable driving experience. The electric steering wheel makes handling easier even at high speeds, and comes with height as well as reach adjustment functions. The adaptive air suspension intervenes a sudden change of drive surface and instead stops the disturbance experienced at the wheel itself without letting it travel to the body. It also plays a crucial role in maintaining the vehicle’s position and also helps reduce rolling or pitching motions when cornering, braking or starting up. On rough roads, the ride quality feels neat and the same is felt on smooth sections as well except for a minor issue of body roll. The tall positioning of the Q7 makes it feel a bit rigid around corners making it sway on curvy sections. One can personalise the damper settings and the handling in five different ways. Just work on the rotary knob and the MMI screen offers options such as automatic, comfort, dynamic, off-road and lift. The comfort and dynamic are the ones you would need on a daily basis as they ensure smooth ride quality. The adaptive suspension senses the speed and accordingly lowers the body and adjusts the dampers. This also helps in creating a lower centre of gravity. The purpose built off-road mode raises the body by 25mm while the core lift mode can raise the trims by 60mm.The diesel engine feels as ease at above the initial range where the motor keeps revving with a strong will to go further. It is not a typical floor it to redline it motor as the weight of the Q7 doesn’t encourage hurried style of driving but saying that its potential to maintain triple digit speeds is impressive. It delivered an overall fuel efficiency of 9kmpl. The Q7 is Audi’s flagship SUV and has all the bells and whistles of a luxury car. The eight-speed transmission system can be operated through the paddle shifters mounted on the steering. The leather wrapped steering is also mounted with control switches that operate the music system along with the multi-function information display. It gets an electrically operated panoramic sunroof, power seats with memory function, power mirrors that are retractable with the auto-dimming function. The four-zone climate control system comes with individual vents for all three rows. The instrument cluster is a TFT screen and reads out all the necessary information including navigation maps, instantaneous and average fuel economy, distance to empty et al.On the safety front, the Audi Q7 gets a cocoon of eight airbags and an electronic stability program replete with ABS, EBD, brake assist, traction control and skid control. It also gets ride height adjustment for off-road driving. Intelligent LED headlamps and tail-lamps are standard. So, that’s the second-generation Audi Q7 for you. It’s an SUV that, in many areas, feels like it’s made a two generation leap over its illustrious predecessor. The superbly executed cabin, strong performance and high level of refinement lead the long list of reasons you should be interested in one. Of its few shortcomings, it’s the Q7’s unsettled ride that’s most notable. Then again, a less than perfect ride didn’t stop the original Q7 from finding space in every possible celebrity’s garage.But this leads me to the question — will image-conscious Indian buyers fond of the old Q7’s bulky form readily take to the new one’s more refined shape? Well, that’s something we’ll know soon enough when it’s launched next month. What there’s no debate about is the fact that the new Q7 sets new benchmarks in the premium luxury SUV segment in several areas. Priced from Rs 72-77.5 lakh (ex-showroom, Delhi), it isnt be cheap but, packed with tech, it’s as modern and cutting edge as they come.